Bournemouth managed to end a run of four straight league defeats by defeating an impressive Huddersfield side 2-1 at the Vitality Stadium on Tuesday night. Huddersfield dominated the game, playing good attacking football and taking the game to a usually free flowing and attacking Bournemouth side. The home side had to soak up pressure from the off, but managed to break the deadlock after just five minutes. 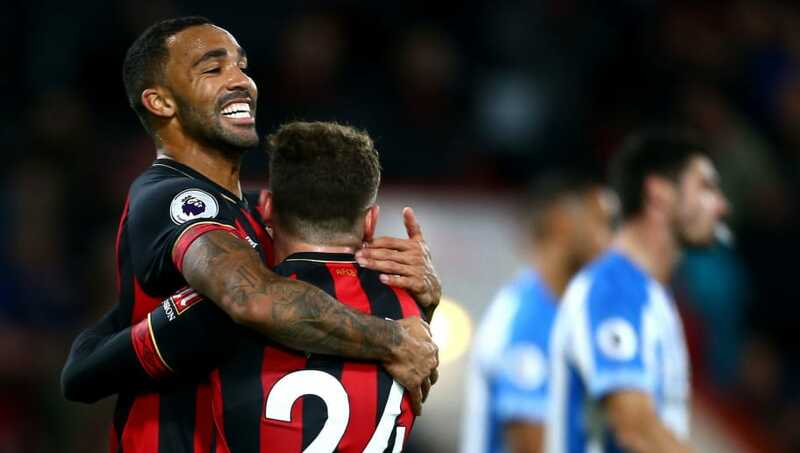 Callum Wilson headed in from Ryan Fraser's whipped cross before the Scot slotted under Terriers goalkeeper Jonas Lossl to double the home side's lead. Huddersfield did get the goal their play deserved a few minutes later when a set piece from Mooy caused havoc in the Bournemouth area. A combination from three lofty Terriers defenders resulted in the ball beating Begovic. Schindler won the initial header, before Jorgensen's intervention fell to Kongolo, who looped his effort over the diving goalkeeper. The second half saw no change, as Bournemouth sat back as Huddersfield continued to move the ball around the pitch quickly. However, their pressure in the second half came to nothing as Bournemouth did their best to keep them at arm's length. The Cherries held on to a vital win which halts a run of four consecutive defeats. However, for Huddersfield there were definitely plenty of positives but no points to be taken from their trip to the south coast. Despite their victory in this game, Bournemouth were far from impressive and barely managed to get out of their own half during many spells in the game. Pivotal playmakers Lewis Cook and David Brooks were hugely absent throughout the game as they were swamped by a very physical Huddersfield midfield of Mooy, Billing and Hogg. It will give manager Eddie Howe plenty of food for thought, as Bournemouth are very capable of playing football which dazzles on the eye. However when they are not firing, can they grind out results? They did on Tuesday, but an opponent with a more potent attack would have beaten them. Starting XI: Begovic (8); Francis (7), S Cook (7), Ake (7), Daniels (6; Brooks (5), Lerma (6), L Cook (5), Fraser (8); King (7), Wilson (8). Substitutes: Stanislas (6), Mousset (5), Mings (5). Star Man - Eddie Howe will be delighted with the current form of striker Callum Wilson. He registered an early goal and an assist to put Bournemouth 2-0 up in this game, which was just enough to see his side edge past an impressive Huddersfield team. Wilson looked confident in his touches and was always willing to turn the Huddersfield defenders and get them running back towards their own goal. Based on this form, you can see why he could continue to be a part of Gareth Southgate's England squad. Worst Player - David Brooks was relatively anonymous during the game and was eventually replaced by Junior Stanislas after an hour. Brooks has been shining in a very attack minded side, however in this game, his team had to contain opposition attacks and spent long periods of time without the ball which starved Brooks' talents, meaning he had relatively zero effect. Huddersfield played terrific football during the game. It was fluid and fast in attempting to provide chances for lone striker Depoitre. The out ball to Hadergjonaj was very effective in the first half, as he gave Daniels plenty of issues, whipping in dangerous balls that were defended well by the Bournemouth backline. Their goal came from a combination of headers from defenders and physical battling from a set piece. Their possession play did very little and didn't suit Depoitre, who worked hard and missed a terrific chance in the first 45. If Callum Wilson was in a Huddersfield shirt, this game could have been very different. Starting XI: Lossl (6); Jorgensen (6), Schindler (6), Kongolo (7); Hadergjonaj (8), Mooy (7), Hogg (7), Billing (7), Durm (6); Pritchard (8); Depoitre (6). Substitutes: Mbenza (5), Sabiri (N/A), Sobhi (5). Star Man - Alex Pritchard provided plenty of energy and creativity in the Huddersfield attack. He looked bright throughout, making plenty of great touches and looking dangerous when he received the ball, looking to be direct whenever possible. He would have worked terrifically with a more mobile forward ahead of him. Worst Player - Eric Durm played on the opposite flank to Hadergjonaj before moving up the pitch as Wagner adjusted his sides shape after the second Bournemouth goal. He looked out of place in the opposition half, not really contributing anything and looking very much like a defender who had been pushed out of position. Bournemouth will hope this win will give them some momentum as their next Premier League fixture is Saturday lunchtime, when they face Liverpool at the Vitality Stadium. Huddersfield will take plenty of positives from this game, but they have another tough away trip on Saturday when they travel to north London next to take on Unai Emery's in-form Arsenal side.